Welcome to my January 2018 Reading Recap where I get to look back over a fun month of reading! I read eight books during the first month of 2018 and I most definitely went on a thriller binge and read some tense, enjoyable books. I’m feeling quite a bit more relaxed about my reading this year. 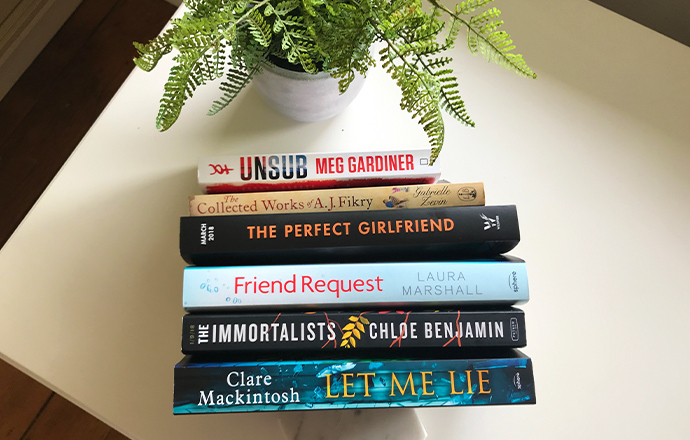 In 2017 I set a really ambitious reading target and while I did eventually reach that target, I went through a couple of bad reading slumps throughout the year and struggled to not feel like reading was a chore at times. Sure eight books is quite a lot to read in a month, but at no point did I feel like I was obligated to read any of the books I chose, and that was a refreshing change. I also, without meaning to, only read books written my women this month. That may also partly explain why I loved reading so much this month, although none of them were Australian so I shall try to address that in February. This brings us to the end of my January 2018 Reading Recap and as I write this in early February I’m pleased to let you know that my thriller binge has continued. Have you read any of my January reads yet? Leave a comment and let me know!